Que Syrah Syrah… one of the wine world’s most beloved and least understood grapes! Known in Australia as Shiraz and in France by the names of the various Rhone villages in which it features prominently in the local wines, Syrah is a versatile winegrape capable of standing alone or enhancing blends. 1. Syrah and Shiraz are the same grape! Known as Syrah in France (its country of origin) as well as in the rest of Europe and most of the United States, it is referred to as Shiraz in Australia, New Zealand, South Africa, and Canada. The name “Shiraz” may have originated from ancient Persia. 2. Syrah should not be confused with Petite Sirah, which is an entirely different grape (and not just a smaller version of Syrah grapes, as the name suggests); Petite Sirah is actually a hybrid grape variety created in 1880, which crossed Syrah with another grape variety called Peloursin. 3. 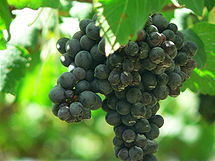 Syrah wines typically yield flavors of blackberry, black or white pepper, espresso and, occasionally, olives or bacon. 4. Due to their concentrated flavors and high tannin content, many premium Syrah wines are at their best after some considerable bottle aging. Single varietal Syrah or Shiraz. Syrah blended with a small amount of Viognier (an aromatic white wine); this is the traditional style of Côte-Rôtie in France’s northern Rhône valley. Syrah as a roughly equal blending component for Cabernet Sauvignon. This blend originated in Australia, so it is often known as Shiraz-Cabernet. Syrah as a minor blending component for Grenache and Mourvèdre. This is the traditional style of Châteauneuf-du-Pape of southern Rhône, and in Australia this blend is often referred to as GSM (Grenache/Syrah/Mourvèdre). Explore this versatile grape yourself by trying one of the following Temecula Valley Syrahs! Wine pairing suggestions include: grilled flank steak or lamb chops, antipasto or tapenade.